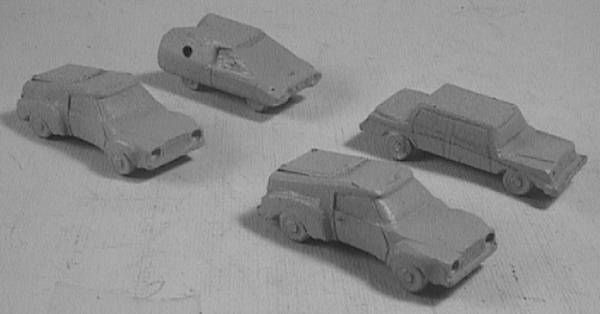 Irregular also offers two packs of cars in their 6mm range. The first pack consists of an assortment of modern car styles, while the second has the same assortment modified with armor plating, spikes and various weapons. Both packs are also available from Eureka Miniatures. Miniatures from this racing game can be easily modified into suitable, if somewhat small vehicles. Cars and pedestrians in both 1:16" scale (1:196) and 1:20" scale (1:240) are suitable, though their minimum order ($50 US) is a bit steep. KBG produces a line of car miniatures designed for Formula De by Chessex. Like the original cars in Formula De, these are a little on the small side. Plastruct offers a large range of cars in various scales, useful for both model railroads and architectural models. Their online catalog has every item listed and illustrated, but it's almost impossible to find anything if you don't own the paper catalog. Scale ranges from 1:200 (which is a little large) to 1:250. Plastruct also has a small selection of figures in the same range of scales. 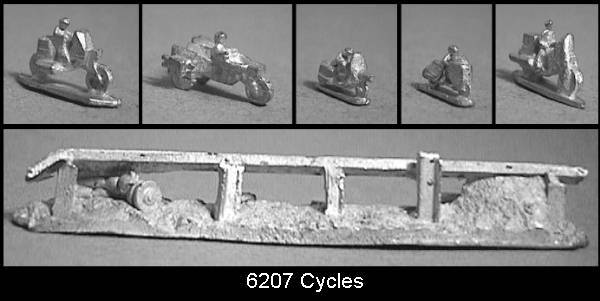 As part of their Days of Empire 6mm SF line they have a package of civilian vehicles. 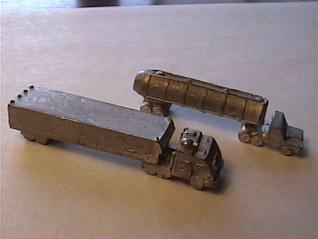 Various companies (most of them in Germany) have both cars and figures for Z-Scale (1:220) model railroads. The majority of these models come pre-painted and are quite expensive. 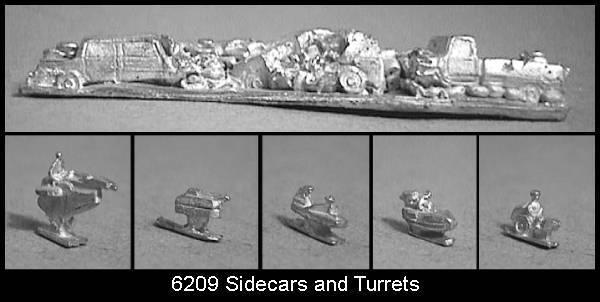 Citadel released these miniatures for their Battlecars game in the mid 1980's. There were two major releases, the second being in a slightly larger scale (though close enough). As far as I can tell, all of these miniatures were released in random assortment blister packs with the same item code. Dark Horse released several blister packs of Car Wars scale vehicles. The only description I have seen of the miniatures was that they were "spiky" and each car was packaged with a matching wreck. In early 1983, Steven Jackson Games sold the molds and masters for their official miniatures to Grenadier. Grenadier released all the original packs with no changes (even on the same blister card), and added one package of trucks (6210) to the line. It continued until somewhere in the late 1980's when the line was cancelled. I spoke with one of the sculptors for QT models. 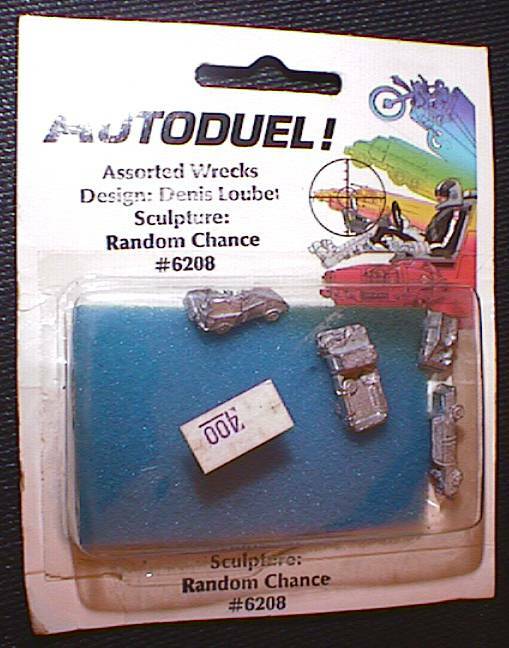 Apparently they released a few packs of Car Wars scaled vechicles at one point. The line didn't sell terribly well though. Steve Jackson Games produced the original miniatures in 1981. A company by the name of T-Rex did the actual casting. Shortly after that, they sold the license to Grenadier. As mentioned on their website, it would be virtually impossible to tell a SJG miniature from a Grenadier miniature, since they used the same masters, molds and even item numbers and blister cards. This line of Matchbox cars came out in the early 1990's. Apparently they were a good match for 1x scale car wars. I believe that they are out of production now.